Hey. It’s One and Done Sunday. One picture, and five links that are worth your time. 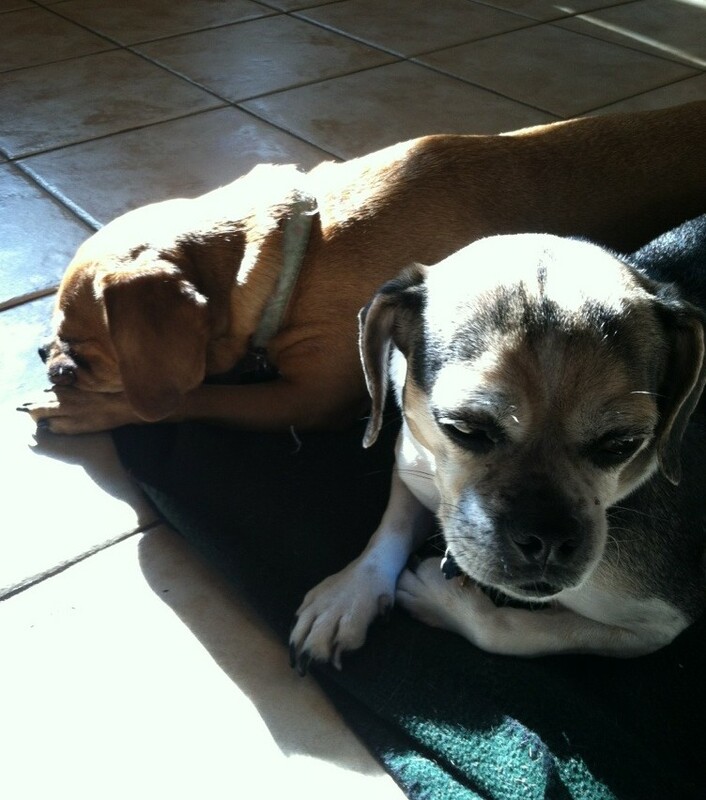 Here’s a shot I got of the Puggles sharing a sunbeam. It has nothing to do with any of the links; I just think they’re cute. Easter confounds me. It’s never been a strong holiday in our thrown-together family and for some reason, it’s up to me to make it happen. I’m 0 for 7 so far on Easter. I blame the Easter Bunny. Specifically, I blame the Easter Bunny in my latest post over on Family Circle’s Momster Blog: Holiday Tradtions in Blended Families: Easter Edition. You guys! I got a dead squirrel sculpture named after me! Kimberly Witham, an artist who makes these awesome Martha-Stewart-esque scenes with roadkill, does the most fasicinating condensed taxidermy video I’ve ever seen. Of a squirrel named Randolph. Now in Technicolor on Roadside Resurrections. Hey Moms (also Dads, sisters, brothers, step parents, grandparents, babysitters, etc). Have you had to go buy a girl her first bra yet? Have you discovered that pretty much the only things available are completely age-inappropriate pushup bras that don’t fit her right anyway? Megan Grassel, a teenager, had that experience last year when she took her kid sister to buy her first bra. Then Megan did something about it. She Kickstarted a company called Yellowberry. Here’s a writeup about them on Lingerie Talk. I was thrilled to find that they’re completely sold out on their website right now. Thank you, Megan! This so needed to happen. Be Fed Again is great blog detailing the restoration projects of an old farmhouse that some friends of mine live in. Brooke also includes some recipes that are pretty great. This entry is about a simple way she refurbished the kids’ bathroom, for about $70. I’m actually considering this project because it doesn’t seem like too much more work than repeatedly shutting the door to that bathroom and denying its existence. Ch-Ch-Ch-Changes on Be Fed Again. Do you know Audra Mae? I just got turned on to her second album, Audra Mae and the Almighty Sound. Click here to preview it on iTunes. Posted on April 13, 2014 by JM RandolphPosted in One and Done SundayTagged accidentalstepmom, JM Randolph, picture of puggles in a sunbeam, stepmom blog. Previous Previous post: That’s Hot. Thanks for the suggestions…they sound good and gives me something browse other than that horrid site beginning with F! Thanks for the insight on Easter, it’s always confused me too. The concept of a guy coming out of a cave, and if seeing a rabbit laying eggs we would have several more weeks of winter never made much sense. Julie, thank you so much for the shout out! This project is one of my favorites so far! Very easy, inexpensive, and oh so satisfying! Thanks again!